Dr. Joseph Nolan, the founder of Colander-Nolan Eye Clinic, graduated from St. Rita High School in 1942. Following high school he enlisted in the United States Air Force and served as a fighter pilot in World War II. After serving his country Dr. Nolan graduated from Illinois College of Optometry in 1949 and opened his first practice in the Brainerd Community, The Nolan practice moved to 95th and Cicero, Oak Lawn, Illinois in the Green Oaks Shopping Center in 1958. 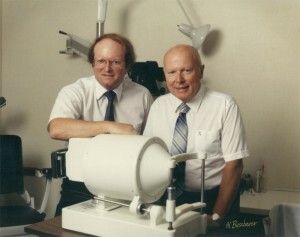 Dr. Joseph Nolan was a prominent Oak Lawn Optometrist and Contact Lens Specialist. His local research in contact lenses, evolved to the science of Orthokeratology, the use of a programmed series of contact lenses to change the corneal curvature and improve unaided vision. Dr. Joseph Nolan lectured in many areas around the world, even winning the MIKE Award for the most prolific lecturer in the State of Illinois. The Practice remained in Oak Lawn until present building at 11412 S. Harlem was completed in January 1980. In the late 1970s Nolan Eyecare became a second generation practice with addition of Dr. Joseph Nolan’s son, John. After graduating from Brother Rice High School, John earned his undergraduate degree from Northern Illinois University. Dr. John Nolan followed in his father’s footsteps and obtained his doctorate from Illinois College of Optometry. Dr. John’s work emphasized the importance of yearly contact lens checkups by an eye specialist to avoid corneal problems, as well as, the importance of eye examinations for everyone at a very early age. In November of 2011, Dr. John Nolan lost his battle with cancer. Both Doctors were and continue to be remembered for their great Optometric care of their patients. In September 2013, the Nolan Family welcomed Dr. Mark Colander to the practice. Dr. Colander is a Southside native from Queen of Martyrs Parish and a graduate of Brother Rice High School. He obtained his Bachelors of Science degree from Loyola University Chicago and earned his Doctorate of Optometry from Illinois College of Optometry. After earning his optometry degree Dr. Colander completed an ocular disease residency, providing care to Veterans at the Huntington VA Medical Center in Huntington. Dr. Colander is proud to continue on the quality eye care that the Drs. Nolan have provided to the community for more than 50 years.